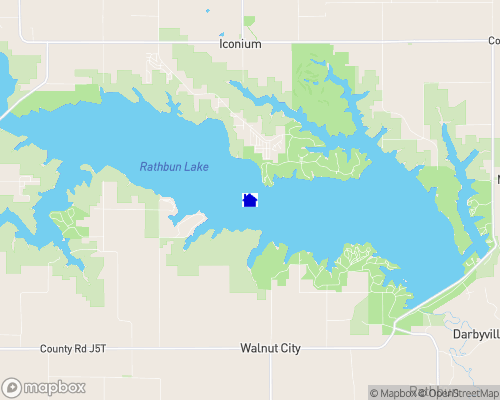 Lake Rathbun is a 11,000 acre Army Corps of Engineer reservoir located in Appanoose County. Facilities include Honey Creek State Park, six Corps of Engineer campgrounds, two marinas and multiple boat ramps. Rathbun Fish Hatchery is located below the lake dam. Iowa Department of Natural Resources biologists raise channel catfish, walleye and largemouth bass at the hatchery. Visitors are welcomed during normal working hours. The reservoir is known throughout the Midwest for outstanding crappie fishing. More than 167,000 crappies are harvested from the lake each year. Each spring soon after ice melt anglers experience some of the best channel catfish fishing found anywhere. Summer months, June through August, provide excellent walleye and white bass fishing. The lower lake section extends from the dam into the the Honey Creek and Ham Creek arms and extends up the main lake to the Island View West Area. Specific locations in this area are good for crappie, walleye and white bass fishing. Lake water quality is always best in the lower lake portion. The mid lake section begins at the Island View area and extends to the Rolling Cove area. Anglers seek this area for walleye and white bass. Crappie Cove is a favorite area among crappie anglers. The upper lake area begins at Rolling Cove and extends above the flooded timber line. This is a favorite area for white bass and walleye fishing. The flooded timber area extends into the channels of the North and South Fork Rivers. Channel catfish fishing is excellent in this area. Most of the ice fishing occurs in the Atwell area of the North Fork. Boat access: Many around the lake. The lower lake section extends from the dam into the the Honey Creek and Ham Creek arms and extends up the main lake to the Island View West Area. Specific locations in this area are good for crappie, walleye and white bass fishing. Lake water quality is always best in the lower lake portion. The mid lake section begins at the Island View area and extends to the Rolling Cove area. Anglers seek this area for walleye and white bass. Crappie Cove is a favorite area among crappie anglers. The upper lake area begins at Rolling Cove and extends above the flooded timber line. This is a favorite area for white bass and walleye fishing. The flooded timber area extends into the channels of the North and South Fork Rivers. Channel catfish fishing is excellent in this area. Most of the ice fishing occurs in the Atwell area of the North Fork. Rathbun Marina at Buck Creek: (641)724-3212 Located on Lake Rathbun in south-central Iowa, provides recreational services including boat rental, slip rental, campgrounds, lodging, restaurant, bait shop, and convenience store. Southfork Marina: (641)647-2625 Southfork Marina is a more secluded location and the most beautiful of all lake campgrounds. The property is maintained by professionals with mature trees and lake views. Both electric and primitive sites are available. Appanoose County combines charming communities, peaceful rural life and a progressive attitude in a way few areas in the country do. They offer affordable housing, quality healthcare, top-notch educational opportunities, progressive law enforcement, a variety of churches, clubs and organizations and a mixture of arts and culture. It's easy to see why there is such a strong sense of pride among the residents of Centerville and Appanoose County! The Centerville Concert Association sponsors a concert series each year. The series of four or five concerts features a variety of instrumental and vocal performances. Season ticket holders can also attend performances in Ottumwa and Chariton at no additional charge. During June and July the Municipal Band performs at the band shell on the historic courthouse square on Thursday evenings. Bring a lawn chair and enjoy homemade ice cream and a slice of pie provided by local churches and organizations. From April to October you can enjoy a Saturday evening show at Rathbun Country Music Theatre. A different show is performed each week by the eight person house band and special guests. Curtains Up, the local community theatre group, conducts one performance per year. Plays include comedies and musicals. This year's production will be the musical "Give My Regards to Broadway." Performance dates will be July 12, 13, 19 and 20. Centerville Community School District operates eight school buildings and has approximately 1,800 students enrolled. Their five K-3 elementary buildings including three in Centerville, one in Cincinnati and one in Mystic. Class sizes in the K-3 buildings range from 12 to 26 students. Nearly half of the classrooms have 19 or fewer students. All students in the district attend Lake View Elementary which houses grades 4 through 6. Class sizes at Lakeview range from 19 to 26. Seventh and Eighth graders attend Howard Junior High in Centerville.